We are the designers and manufacturers of the Premium Ultimate Bespoke Curved School Canopy. Any size. Any Colour. Made to measure. Built to last! Practical. Safe & Fully guaranteed. Warning: please do not attempt to compare our school canopies with our competitors, they are simply not the same. Our school canopies are made from steel so they are built-to-last. The structure is super strong, which means we can span large distances without intermediate posts. Aesthetically, our canopies are stunning in both quarter curved or half curved styles. Our school canopy roof cover has UV protection built-in for the ultimate in protection, which means our canopies are designed to allow the school to extend the classroom outdoors and use the canopy for all-weather learning. Our school canopies can also be used for the following applications around your school or university. Our school canopies and shelters are hot dip galvanised for complete rust protection and then powder coated to your chosen colour. This gives you a long-lasting finish. 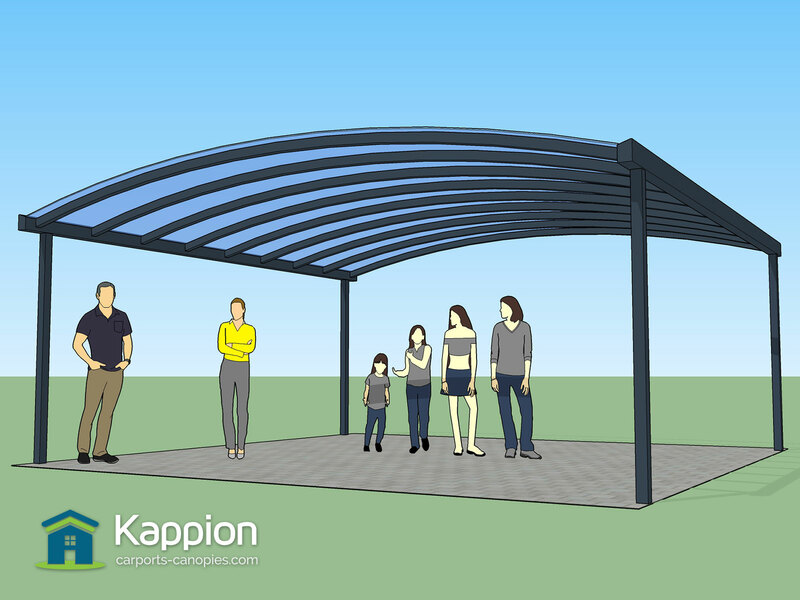 When you commission a school canopy installation with Kappion you can be reassured that it will be custom designed and structurally engineered to work with your geographic location. It will be designed to withstand the snow loads and wind speeds for your area. The school canopies that we install are made from steel for the ultimate strength and resilience. They are hot dip galvanised for complete rust protection. Once galvanised the canopy will be powder coated to your chosen colour. Guttering and downpipes will be designed to meet your exact requirements, which will allow water to be directed to the nearest surface drain, keeping the canopy area dry.